Evolving classification systems for cancer cachexia: ready for clinical practice? Involuntary weight loss, the defining factor of cachexia, is a common consequence of advanced cancer. This review summarizes the actual cachexia definitions and classification systems (NCCTG-studies, Loprinzi et al. ; PG-SGA, Ottery et al. ; Cachexia Consensus Conference, Evans et al; Cancer Cachexia Study Group, Fearon et al. ; and SCRINIO Working group, Bozzetti et al.). We describe the ongoing development of a new classification system for cancer cachexia, which is based on literature reviews and Delphi processes within the European Palliative Care Research Collaborative. The review describes the evolving understanding of the pathophysiological mechanisms of cachexia and outlines an overview on treatment options. In this review an outlook on the requirements of a new decision guiding instrument is given and the challenges in clinical decision making in palliative are discussed. 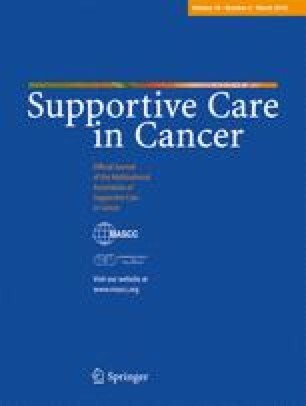 The authors are part of the European Palliative Care Research Collaborative.